If I were asked to name a Top 10 list of products that over the last decades have revolutionized the way we fish, Berkley FireLine would be high in that inventory. FireLine was introduced in 1996. It's not a braid (weave), rather a linear bundle of polyethylene micro Dyneema fibers that are thermally fused — thus the first fused "superline." Stren Kevlar, also introduced in the mid 1990s, consisted of woven Kevlar fibers. The finished product was not thermally fused — thus a pure braid, the first braided superline. The popular braids on the market today — PowerPro and Spiderwire Stealth, for example — are much improved, but still have the same basic braid characteristics, namely, ultrathin diameters and an exterior that's slightly rough. Run your fingernail down a braid and there's a zzzzzt to it. By comparison, because of the thermal fusing, FireLine has a smoother exterior than braids. It also has slightly more diameter than comparable break-strength braids, although it's still very thin. The characteristics of fused line stand in stark contrast to monofilament — no stretch, limited memory, and in tiny diameters and comparative break strengths off the charts. It's so smooth that it casts beautifully. The combination means longer casts, but you can still set hooks at long distance. The no-stretch factor also intensifies sensitivity, allowing the angler to better tell what's happening at the end of the line. While at first backlashes and the occasional floating bird's nests look like disasters, one soon learns that most of them can be picked free. Be careful, however, to keep line tight to the spinning reel spool when the reel's first engaged after the cast. It's best to stop the line at the end of a cast with one hand and snap the bail shut with that hand, as opposed to just snapping the bail shut by engaging the reel handle. Fused lines aren't always a beautiful work in progress for beginners. Anglers typically rely on spinning tackle for presentations with fused lines testing up to 14 pounds. In a lineup of reels like the Pflueger Supremes, the 25 model is on the ultralight end of a spectrum, so I use a 30-class reel for most fishing situations, although a slightly larger 35-class works as well. Heavier fused lines work well on bigger spinning reels — 35- and 40-class reels — or on casting tackle. In the knot realm, both the Palomar and uni knots are as strong and practical as they are easy to tie. When in doubt, double the end of the line. With doubled line even a simple three-wrap improved clinch knot won't slip and breaks at more than 100 percent of mainline strength. But don't trim knot tag ends too close. Although 14-pound has the approximate diameter of 6-pound mono, its true break strength is closer to double the 14 pounds; so 14-pound can handle just about anything in freshwater, and when pulling stumps is necessary step up to 20-pound. Within five years of introduction, I was using FireLine on most of my rod-and-reel combos. That's still true today, although some braids are superior in some situations, particularly on casting reels for heavier applications like big bass in dense vegetation, big catfish, muskies, stripers, and sturgeon. It's noteworthy that some anglers simply prefer braids, even in situations where I prefer a fused superline. This past season I also used Sufix Fuse, another fused line consisting of Dyneema fibers. It fishes beautifully, allowing long casts and superior hook setting, even at a distance. It's smooth as can be. Stat-wise, FireLine and Fuse are identical — 10-pound has the diameter of 4-pound mono; 14-pound has the diameter of 6-pound mono. FireLine is available in the original Smoke color as well as Flame Green. Meanwhile, FireLine Crystal has a white finish that's billed as translucent. I've spent hundreds and hundreds of hours fishing with Crystal. It is, indeed, translucent in waters with some color. In clear water, however, it is highly visible and stands out as much as Flame Green, so I use a 6-foot section of fluorocarbon at the end. There was a time I could hit an 85-mph fastball. Smoke is difficult for me to see now, but it works fine in situations where visibility isn't a critical part of the presentation. When I'm casting swimbaits and most deeper-diving crankbaits any color line works. Fused lines float. So when I'm working anything that suspends, like an X-Rap, a bright line lying on the water aids in bite detection, acting in many ways like a float to transmit bites when yo pause the lure. Sufix Fuse is available in Fluorescent Neon Flame and Smoke Blue. Fused lines don't stretch so there's no need for mighty hook-setting power often applied with a monofilament that might stretch as much as 20 percent. Simply tightening up on the line usually gets the job done. The rod, meanwhile, should be medium power and a medium to medium-fast action — otherwise you tear hooks. Adding a fluorocarbon leader to the end of a fused line does more than aid in reducing line visibility. I often see writers touting the abrasion-resistant qualities of superline, but in diameters up to 14 pounds, the lines are so thin that they cut quickly in contact with a sharp edge, like the teeth of a pike or a zebra mussel shell. Increasing line diameter increases abrasion resistance. Fluorocarbon is supposed to be largely invisible to fish, so you can increase the diameter of a leader to increase abrasion resistance. If I fish with a 10-pound fused line I might use a 12-pound or 15-pound fluorocarbon leader. When casting swimbaits and crankbaits with 14-pound fused line I typically use 20-pound fluorocarbon. 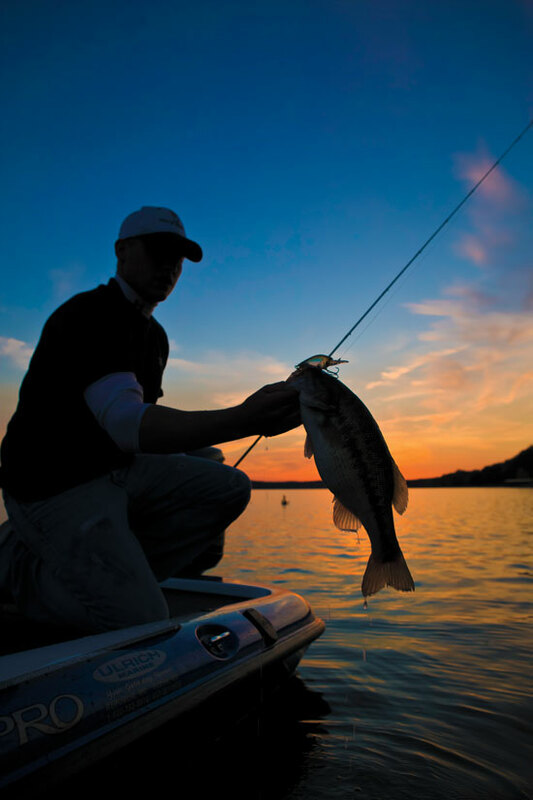 The diameter of the fluorocarbon also makes it easy to handle fish at boat side — it's easier to grab the thicker line. Adding a fluoro leader means learning how to make the back-to-back uni knot connection that couples it to the fused line. Instruction in tying this knot can be found on-line or in every good knot-tying book. Fused line up to 20-pound test is so thin (and slick) in comparison to thicker fluorocarbon that you must double the end of the fused line before making the connection. Even a double overhand knot will do, but a two-wrap spider hitch is better. Back-to-back four-wrap uni knots make a sturdy connection. But always pull steadily and firmly on the connection to test it before putting it into action. Fluorocarbon isn't as shock-resistant as fused line, so eventually the connection begins to wear. Continue to test it occasionally as you fish. Expect to have to retie from time to time. Granted, fused line is expensive, but it also lasts a long time. I typically put an entire season's use on some spooled reels. When spooling up, fill the reel half full of monofilament before adding the fused line. One advantage to getting to fish for everything from tarpon and goliath groupers to largemouth bass and stripers is in learning just how brutally hard one can pull on superlines without having them break. This, to give just one example, is the key to beating largemouth bass when they're near cover. Fishing rattlebaits over the lay-down timber in parts of Stick March, Florida, so long as one never gives an inch once a fish hits, the bass always go up instead of down where they can bury in cover. Then the only problem is having the hooks thrown or having them bend out. Replacing regular hooks with 4X versions like the Eagle Claw 774 is the answer to yet another challenge created by using these incredible lines.